This week we’re speaking with Dr. George Katsiaficas, author and contributor to over a dozen books on Peoples Movements and the elucidator of the Eros Effect. 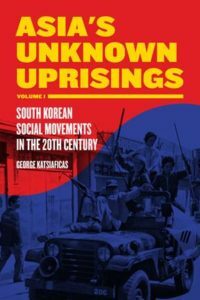 For over a decade, Dr. Katsiaficas has been studying the culture and history of South Korea and it’s culture and has just published the first volume of a two part series on People’s uprisings in Asia, entitled “Asia’s Unknown Uprisings: South Korean Social Movements in the 20th Century” from PM Press. Our conversation ranges from cultural tendencies in Korea towards autonomy and the commons, to the Kwangju uprising of 1980 and even to the sister city of Santa Rosa, California, Jeju City, and their continued resistance to the building of a U.S. naval strike base.